Spark an interest in nature and homegrown, fresh and healthy foods for your little ones by growing your own plants and mini-garden indoors. Most fruits and vegetables in your pantry can provide an educational and fun experiment for young children. It’s easy to green the thumbs of your toddlers — if they can hold a seed in their hand and can poke a hole in dirt, help them plant the seed and watch it grow together! Follow our easy guide to get your indoor garden growing after the jump! Bell pepper seeds, sunflower seeds, dry peas and beans are easy to start and fast growing. Picking plants that have fast germination will keep a toddler interested in their growing progress. Choose a room in your home with good lighting and a sunny window sill. Children love to see things as they happen and much of the growing action happens and stays hidden in the soil. So, to start out, grow plants without soil to enable kids to see the changes, right before their eyes. 1. Scrunch a paper towel into an old jar. Try to involve your tot in as many ways as you can. For example, allow them to help on the hunt for the perfect jar in the cupboard. 2. Sprinkle 5 seeds, such as kidney beans into the jar. Move them into the folds closest to the sides of the jar so they are in plain view for little eyes to see. 3. Water enough to soak the paper towel and leave a small puddle at the bottom of the jar. If your child over-waters, gently pour out the excess water. Too much water may rot your seeds. 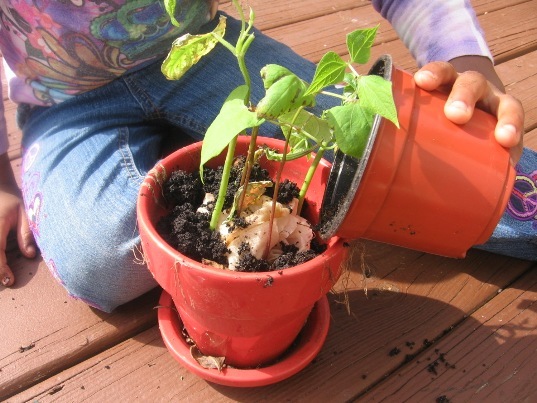 Allow kids to use their sippy cup or a small cup to water the plant. A sippy cup can be the perfect watering can. Time watering to when the paper towel has dried out and needs to be moistened again. 4. Place your growing plant in a good sunny spot. Sometimes a bathroom window is ideal, because the steam from the shower and the sunlight create a plant-friendly atmosphere. Allow your tot to take a few pictures every day of their plants. In the end, together you can create a slideshow of the progress. Drawing pictures and telling stories about the growing plants are ways to extend the life of your growing lesson. If the plants aren’t thriving, together think of reasons why it did not work out and try again. Remind your disappointed little one that in order to succeed, we all must have failures to point us in the right direction. Once your jar seeds have sprouted leaves or you see the roots are full and crowded at the bottom of the jar, it is a good time to move them to soil so they have a better chance at long-term survival. Using indoor formula potting soil is nice, but not necessary. Many of us have old pots sitting around with plants that have died. Or many of us have fertile soil in our yards from where we planted annuals the year before. If you are an urban dweller, scooping a jar of soil from your local park isn’t a crime, as long as you don’t scoop up any plants or bulbs in the process. Sometimes buying soil is unnecessary for a small project involving children. It is easy to find fertile recycled soil. Find pots in a similar fashion. Recycle what you have. You can also make a pot by cutting 1-4 drainage holes in a plastic food container. It is a nice way to find a use for a container that has long lost its lid and is not in use much anymore. Fill the pot with soil, leaving at least a ½ inch of space remaining. Some seeds, like pepper seeds start best in soil. Trial and error will best determine what seeds do well in your home in the jar and in soil. In order to flower and bear fruit, your plant must have exposure to other plants and natural elements. Allow your plant a little time with the window open, or even better, outside. Also, try to keep them near other plants. Insects that pollinate may need to give your plants a little love. Sometimes, that pesky fly in the house may be doing you a favor as it bumps into the window trying to escape. As it bounces around the house, bumping into your plants along the way, it is inadvertently pollinating. Creating a plant book of pictures and observations is a tip for your older children. For your younger children, as much hands on activity you allow, the more ownership they have and the more they learn about growing plants. Encourage talking and whispering to your plants. Explain to your child how plants soak in the carbon dioxide in our breath and in return give us oxygen. Indoor growing is completely possible and definitely a fun way to incorporate more green into your home. Happy planting! Plants grow from seeds, because the seeds contain within themselves an embryonic plant and stored food. Thanks for the information. This is the type of indoor gardening. 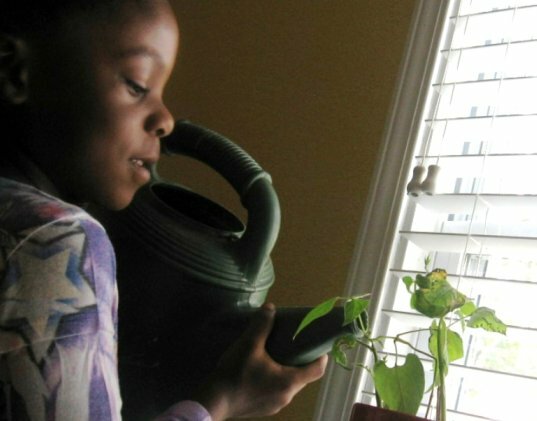 Window sill gardener Amelia chats with her plants she grew from beans.. Spark an interest in nature and homegrown, fresh and healthy foods for your little ones by growing your own plants and mini-garden indoors. Most fruits and vegetables in your pantry can provide an educational and fun experiment for young children. It's easy to green the thumbs of your toddlers -- if they can hold a seed in their hand and can poke a hole in dirt, help them plant the seed and watch it grow together! Follow our easy guide to get your indoor garden growing after the jump! Itty Bitty Red Peppers can grow from store-bought red peppers. 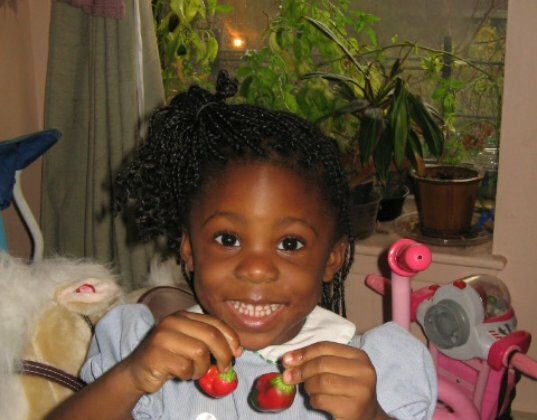 3-year-old Amelia Grows Red Peppers in Her Window Sill.Growing them indoors might make them smaller, but can still put a big, proud smile on your little green tots' face. 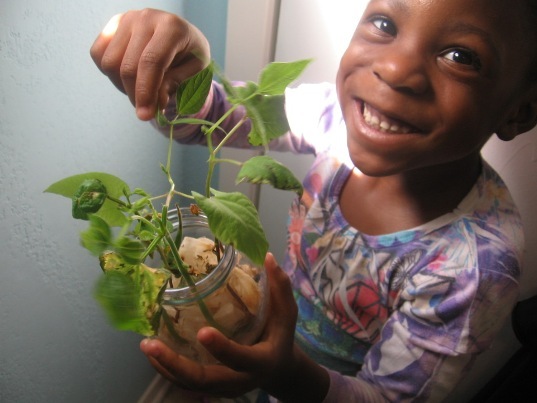 Amelia Transfers her jar of bean sprouts to a pot of soil.